The singer-songwriter from Framlingham, Suffolk took to the stage for an hour-long set after alt-J finished their headline show at the Obelisk Arena last night. 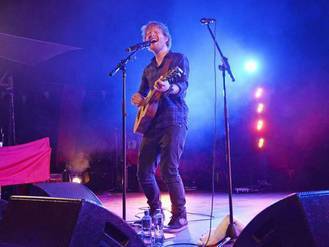 Speculation was rife that Sheeran was set to make an appearance at the festival after he was spotted having a drink at nearby pub, The Station Hotel, with former X-Factor judge Nicole Scherzinger during the day. He confirmed the rumours with a concise tweet saying “iArena, 11pm Latitude” causing a rush of fans to make their way to the venue located deep in the woods of Henham Park, Southwold. Unlike his sold out show at Wembley Arena last weekend, last night’s performance was an intimate affair for Sheeran, who played to a far smaller crowd of around 1,000 people.